Today’s What’s Cooking Wednesday recipe is for those of you who think you have to go to a restaurant or buy the pre-packaged frozen version to enjoy fried mozzarella sticks. You don’t! All you need is some good, fresh mozzarella and the usual items for breading, and you’re good to go. What I made are actually disks not sticks, but that’s because our mozzarella comes in small balls, so I thought it would be easier just to work with it rather than try to make sticks. You’re welcome to cut as you wish. 1. To prepare the mozzarella, cut it into sticks or disks; you can also buy pre-prepared sticks for this. 2. Dredge the mozzarella first in flour before dipping in egg and then the breadcrumb mixture. Unless you’re making a lot of mozzarella, you won’t need as much of the ingredients as listed in the cutlet recipe, so just play around with the measurements a bit until you get the right mix for your taste. 3. 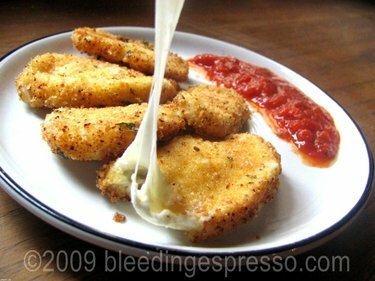 Fry breaded mozzarella in hot olive oil or vegetable oil if you like. Put enough oil in the pan so the sticks are about half-submerged. Let them fry for about 15 seconds on each side and then put them on paper towels to drain. 1. Heat olive oil in small pan and then add garlic and saute for a minute or two, but don’t let it brown. 2. Add tomato sauce and water. 3. Add oregano, salt, and a pinch of sugar if you like, which can cut the acidity of the tomatoes. 4. Let simmer for about 15 minutes, stirring occasionally. 5. Serve hot alongside fried mozzarella sticks. Your actually sound delicious! The ones that I’ve tried at restaurants here in the US were actually only tried and not really eaten. Yes I’ve had some not so good examples myself…. LOOOOVLY, must make it-they will love it here! Hope they’re a hit, Ilva! Yum, I love these, I’ve even made them using *pastella*. I love these. Very nice photos. Yum. They sure were when I made them…I ate them all before P even got home! Yum – silly question for you – I always thought fried mozarella is American more than Italian – is it? hey it didn’t include my comment!!! which was VERY articulate . . . I know…I had to buy some just to make this! 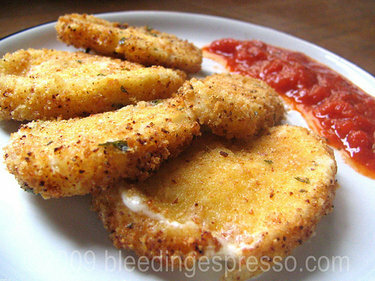 I am loving this fried mozarella. Delicious. am finally getting caught up on what i missed while I was in torino (no internet at marco’s parents’) . . .thanks for all you put together for freelance writing week. You put a lot of thought and care into creating a very useful resource– and were most generous in sharing your best tips and sources. Thanks for that, and I look forward to the second week! Is it possible that there are no calories in this recipe? Wait. It looks sooo good, who cares about hip expansion! Amber’s last blog post..Where’s The Baby? I’ve been so busy lately with real life stuff that I haven’t been blogging much or reading much, and when I return, you have this… oh, my. If one day, you open your door and there’s a vertically-challenged, round-faced girl with a thick Southern drawl asking you for food, you should assume it’s me. And you should feed me. What deliciosity! With the weekend coming up and friends visiting from London, what could be more perfect than your mozzarella sticks and a bowl of tarragon and tomato dipping sauce, along with a glass of wine, to fuel the spring-time bonhomie! Hope you and your friends enjoyed Tessa! C is going to just love you for this. Grazi!